The USD/JPY had a steady week amid a relief on trade and promising US GDP. 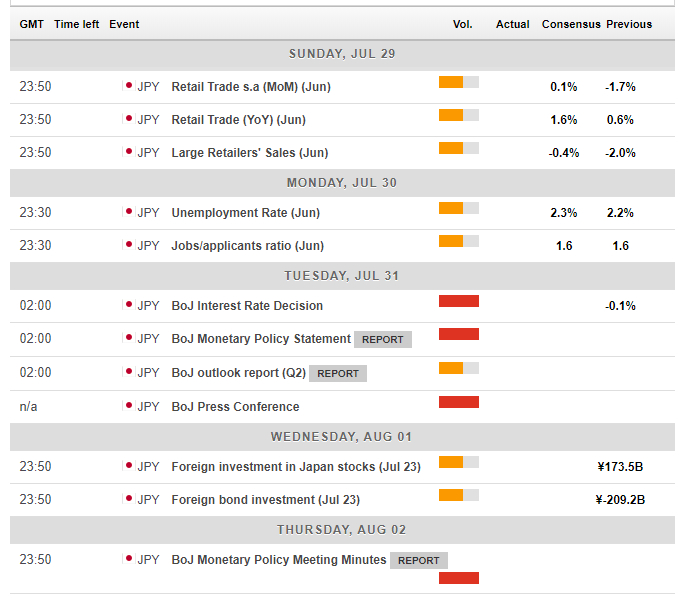 The BOJ, Fed, and the Non-Farm Payrolls promise an explosive week. The technical picture is slightly bullish, but the pair lacks a definite trend. The FX Poll shows a bullish tendency on the pair. US President Donald Trump changed his tack on trade, at least for now. After tweeting that “tariffs are great,” the President had a successful meeting with Jean-Claude Juncker, the President of the European Commission. The gentlemen agreed to talk about trade to reduce them and not to impose new tariffs during the talks. Also, NAFTA talks advanced significantly as we learned from comments by Canada’s Foreign Minister Chrystia Freeland and by the US Trade Representative Robert Lighthizer. Negotiations are moving faster after the Mexican elections concluded early in the month. And while US-Chinese relations remain tenuous, there have been no new developments on that front. The current positive stance may not last beyond Labor Day in early September when the US mid-term election campaigns kick into a higher gear. Nevertheless, the summer allows for some relief and enables the market to focus on other topics. In Japan, speculation that the Bank of Japan will not keep long-term yields at low levels was thwarted by an intervention to keep them low. Nevertheless, the impact on the Yen was minimal. A busy week of US weeks begins with a Pending Home Sales on Monday but warms up quickly with the Core Personal Consumption Expenditure (PCE). This indicator is the Fed’s favorite inflation measure and has a significant impact despite lagging the Consumer Price Index. Despite an acceleration in the Core CPI from 2.2% to 2.3%, Core PCE is projected to see a downgrade from 2%, the Fed’s target, to 1.9% in the read for June. The different methodology explains the differences. Wednesday is jam-packed. The ADP Non-Farm Payrolls report serves as a hint towards Friday’s official Non-Farm Payrolls. July’s growth in private sector jobs is forecast to remain around the 177,000 increase reported for June. The forward-looking ISM Manufacturing PMI stood at 60.2 points in June and is expected to maintain the same levels. The Prices Paid component in the report serves as an important gauge of inflation. The figure remained at a sky-high level of 76.8 points in June, implying substantial inflationary pressures. The best is kept for last on Wednesday: the Fed decision. The FOMC gathering is not accompanied by new forecasts nor by a press conference, but the statement will be closely watched. Markets will look for hints about a rate hike in September, which has growing chances. Also, comments about the fresh inflation and GDP figures will have an impact. While Fed Chair Powell has recently upped the ante when talking about the dangers from tariffs, commentary about the topic may have to wait for the meeting minutes. If the Fed issues a warning regarding trade in the statement, it could weigh on the US Dollar. 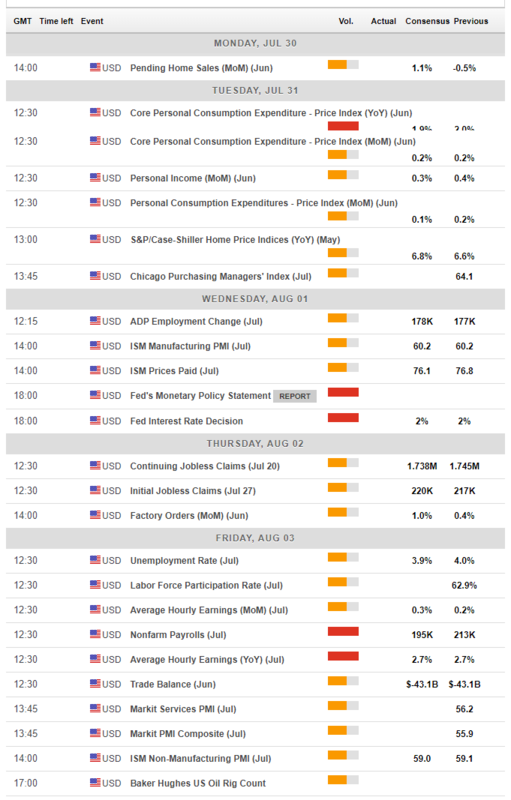 Thursday sees weekly jobless claims and factory orders, but markets will likely be digesting the Fed decision and getting ready for the Non-Farm Payrolls report on Friday. The all-important US jobs report saw better-than-expected job gains in June, 213K. However, wages fell below expectations and remained at an annual gain of 2.7% and a monthly increase of only 0.2%. A faster monthly pace is predicted for July: 0.3%, but the yearly figure is estimated to have remained at 2.7%. Job gains carry the same expectations for a level of around 200,000. Wages continue carrying more weight than positions. The ISM Non-Manufacturing PMI is published after the NFP and will not serve as a hint toward the event. However, the mere publication close to the close of the week may unleash some pent-up volatility accumulated after a busy week. Retail trade data and an update on Japan’s super-low unemployment rate kick off the week, but the primary event is the decision of the Bank of Japan early on Tuesday. The BOJ has been reducing its bond buys of late, allowing the 10-year yield to edge up above the 0% target. This triggered speculation that the Tokyo-based institution is making a “stealth” withdrawal from its extraordinarily loose monetary policy. However, the BOJ may be cutting commercial banks some slack. Meager rates hurt banks’ profits. The BOJ’s primary goal is reaching a core inflation level of 2%, and with sub 1% levels on all the various measures, the Bank still has a long way and will likely leave its policy unchanged. This July meeting could end speculation about any upcoming withdrawal. The reiteration of the BOJ’s loose policy may weigh on the Yen. The central bank may have another opportunity to impact the currency with the publication of the meeting minutes late in the week. However, these are the minutes from the previous decision, and no significant impact is likely. The broad picture for the pair is balanced. The Relative Strength Index is steady around 50 for many days and Momentum is disappearing. However, looking closer, there are a few bullish signs. The USD/JPY is trading on top of an uptrend support line that runs since late May. Also, the pair is holding above the 50-day and 200-day Simple Moving Averages. 111.40 capped the USD/JPY in mid-May and also limited upside moves in late July. The round number of 112 plays a psychological role and also served as support when the pair traded at higher ground in mid-July. 113.20, the peak that was seen in mid-July, is the top line on the upside. 110.55 was a low point in mid-July, and it is closely followed by 110.25 which served as a cushion earlier in July. The very round level of 110.00 is eyed by many. Further down, 109.35 supported the pair in late June. Assuming Trump will not turn back to protectionism, central banks will have their say. The BOJ is set to remain very dovish and the Fed will likely remain hawkish. On this background, the pair is set to rise. The FXStreet forex poll of experts shows a bullish tendency in all periods polled. The short-term forecast has been trimmed down, the medium-term one has been upgraded while long-term expectations remain steady. The moves are not expected to be significant in this steady pair. USD/JPY Forecast July 16-20 – Is the only way up? Or is it overstretched? USD/JPY Forecast July 9-13 – Time to pick a direction? USD/JPY Forecast June 25-29 – Is yen reflecting the trade war reality? USD/JPY Forecast June 18-22 – Will it finally reflect the trade wars? 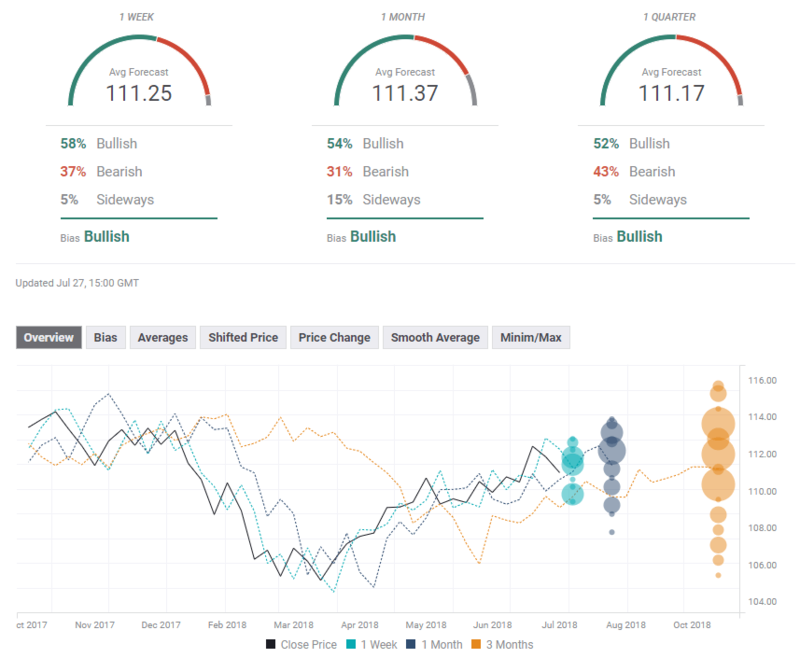 USD/JPY Forecast June 11-15 – Rising with the Kim-Trump Summit?